Last week, @JoshTheGod and his “Underground Nazi H4ck3rGr0up” took over UFC.com for nearly two days. The group hacked the website because of the UFC’s public support of the Stop Online Piracy Act (SOPA) and PROTECT IP Act (PIPA), which would allow the US Government to shut down Internet websites that provide pirated content. After the Ultimate Fighting Championship regained control of their web domain, @S3rver.exe stepped in as a contributing member of @YourAnonNews, another coalition that has loudly spoken out against SOPA and PIPA, and defaced UFC.com and UFC.tv to help the protest efforts. 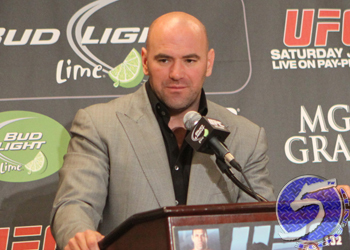 Shortly after the Internet assault died down, UFC president Dana White (Pictured) claimed he couldn’t have cared less what the “terrorists” were trying to do and dared them to attempt another takeover. Hours later, JoshTheGod posted a link containing White’s confidential information, including his current address, phone numbers and Social Security number. However, it appears several pieces of the info released on White was inaccurate. Now that the dust has somewhat settled, one of the hackers has revealed himself to be a 13-year-old from Australia. That’s correct, one of the keyboard crunchers that cracked UFC.com has just barely cracked into his teenage years.